Goa and holidays are synonymous. If you are thinking of beaches, surf, fun, parties, food and adventure, Goa is the place to be. Snuggled on the Konkan Coast in Western India, Goa is delightful to explore. It seems quite incredible that the smallest state in India is so big on its range of attractions. From beaches to history, cuisine to parties, adventures to relaxing, Goa has everything you need for making it the perfect holiday. Take it from me, the annual pilgrim, Goa is fun to explore no matter how many times you have been here. Goa’s shores are a beauty. Beaches are the magical charm that lure you to the coastal state. The beaches of Goa are known for clear azure waters of the Arabian Seas, soft golden sands and bright sunshine throughout the year. The swaying palms, food shacks, flea markets, water sports and nightlife makes Goan beaches the place to be for a perfect holiday. Goa is home to both commercial and quiet beaches, therefore you will always have an option suiting you mood. The beaches in North are the commercialized ones which are known specially for their nightlife. Here you can grab a bite of the tasty food or get a drink or dance to the tunes of the latest party hits. The South Goa beaches are ideal for relaxing and just lazing around on the sun-kissed shores. Here you can take your family and loved ones. Walk on the sandy shores, sunbathe or go for a swim in the waters. You are sure to have an undisturbed time. Calangute Beach, Vagator Beach, Anjuna beach, Candolim Beach, Baga Beach, Cavelossim Beach, Bogmalo Beach, Dona Paula Beach, Majorda Beach, Miramar Beach, Varca Beach, etc are the popular names of the 50+ beaches in the state. Goa’s list of tourist delights is incomplete without the mention of the colonial relics. Churches, Forts and Museums in Goa are an important part of the tourist circuit. For the curious tourists, there are incredible specimens of architecture, history, culture and religious sentiments. The beautiful churches are a memory of the colonial times, especially the Portuguese era. Basilica of Bom Jesus, Church of St Francis of Assisi, Se Cathedral, Church of Lady of Rosary, etc. are the popular names. These fine architectural specimens. Forts have also been a significant part of your sightseeing tour in Goa. The Chapora Fort is unmissable. You can recognize it from the popular Bollywood movie, Dil Chahta Hai. The Aguada Fort, The Corjuem fortress, The fort of Reis Magos, The Sinquerim Fort, The Cabo De Rama Fort, Rachol fort, Nanuz fort, etc. are the popular places to check out. Museums in Goa are not far behind in providing a memorable time. There are a number of museums which chronicle the history, cultural and religious significance. The popular names you must visit include, Goa State Museum, Museum of Christian Art, Goa Chitra Museum, Naval Aviation Museum, Goa Science Centre, and Archaeological Museum. The party capital of India, Goa is all about a happening nightlife. After the sun sets, the real fun starts. Get ready for the hottest party tracks, wild dance moves, sinful drinks and other party pleasure. Clubs, pubs, discotheques and even the beach shacks make your night fun. Grab a drink and get ready to party all night. 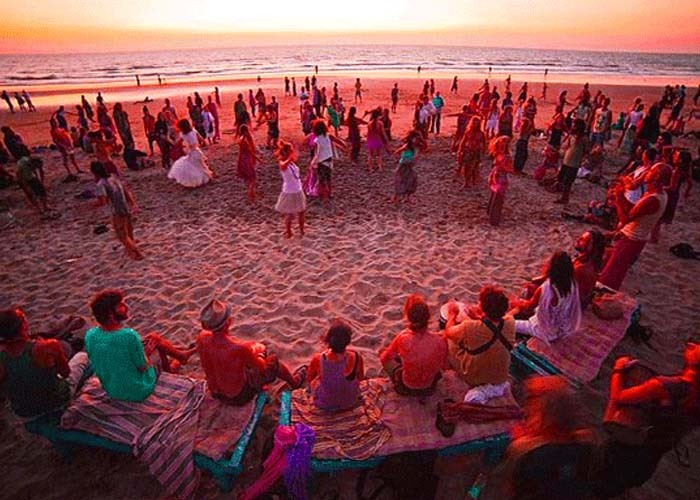 The Silent Noise Party at the Palolem Beach is one you must try. You have the most energetic beats blasting on your headphones without disturbing the ambiance. Casinos in Goa are the star attraction of Goa. Casinos are present both onshore and offshore. Floating casinos are really grand locations to challenge your lady luck. Stationed on the waters of Mandovi River in Panjim, Deltin Royale, Casino Pride, Casino Paradise are some popular casinos of Goa. Sunset river cruise is one of the pleasant and quite ways to enjoy the nightlife in Goa. Cruises leave at sunset for Mandovi River. Spend the night away with dinner and drinks while enjoying local dance and music performances, creating a fun evening. For having the most of the night, the popular options are LovePassionKarma (LPK), SinQ, Club Cubana, Curlie's beach shack, The Pine Shack, Club Cubana, Aqua at The Leela, are some of the places you must check out. The wild side of Goa is not much known to tourist. Goa is one of the world’s biodiversity hotspots. Exotic wildlife species, birds and even flora call the tropical forests their home. During your tour to Goa, make it a point to visit, Bhagwan Mahavir Wildlife Sanctuary, Salim Ali Bird Sanctuary, Mollem National Park, Cotigao Wildlife Sanctuary and Bondla Wildlife Sanctuary. These sanctuaries are a far call from the Goa you have pictured and is really exciting to experience. Watersports in Goa are a major lure of the beach state. 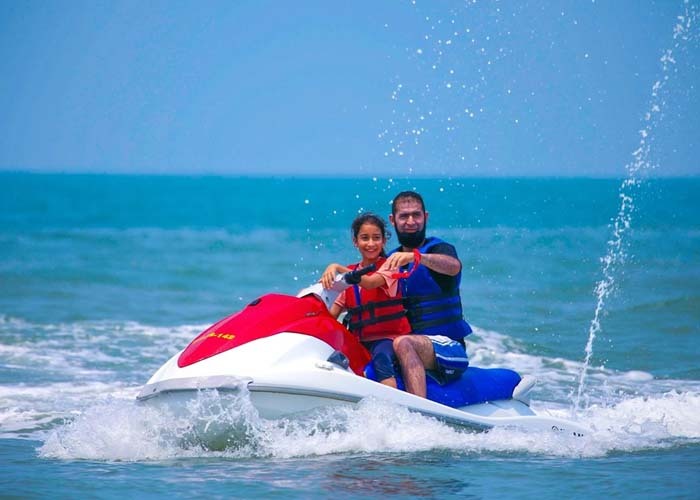 Being close so much to the crystal clear waters of the Arabian Sea, there are abundant watersports to try. For all the water sport lovers, Goa has a variety to offer. Water lovers in Goa instantly fall in love with snorkeling and scuba diving. The marine world opens up its arms to take you close to the incredible wonders. Some of the popular dive spots include Davy Jones, Suzy's Wreck, Grande Island, Tunnel Shelter Cove and Locker Sail Rock. Parasailing, banana rides, jet skiing, ski boarding, windsurfing, speed boats, kayaking, river rafting, dinghy sailing, etc. are among the other popular watersports. North Goa beaches have several sports complexes where you can enjoy these adventure sports for a nominal fee. Shopping in Goa is definitely on the list of your things to do in the beach state. The state is famous for its handicrafts such as terracotta figurines, brass wares, exquisite bamboo artifacts, sea-shell jewelry and water color paintings. Visit the Anjuna Flea Market, held every Wednesday, to enjoy the true taste of Goa. Here you can get a tattoo or get piercings or simple enjoy a gala time with bohemians who call Goa home. Goa is a haven for foodies. The mouthwatering platters of Konkani dishes are up for offers. The fresh catch of the sea make way to your plates. The locally grown spices, cashews and coconut adds unique flavors to the food. Do not miss relishing Feni, an extremely famous Goan drink which is made up of cashew nut. One can never forget the mouth-watering seafood delicacies, prepared from fresh catches- lobsters, tiger prawns, fish steaks and much more. Be it a street-side eatery to a posh restaurant, you can savor Goan local dishes and seafood everywhere. Goa is an awesome place to chill out along with its superb beaches. It is not a difficult job to find tourist accommodation here. During your stay at this beach paradise in India, tourists have an opportunity to explore the insights of this tourist destination. While visiting this wonderful tourist destination, people often enjoy fabulous hospitality of hotels in Goa. Goa’s tropical weather is pleasant throughout the year. Summers months of April and May are slightly hotter but are ideal for enjoying water sports. This is the time when one can avail huge discounts in hotels booking, tickets booking and the rush is comparatively better at beach shacks etc. Similarly, if you do not mind rains, monsoon is also a wonderful time to explore Goa. The rains transform the place into a green haven. However, if you are here for water activities, you can give this season, a miss. The best, in fact, the peak season in Goa is from October to March. Festivities like Christmas, New Year’s and Goa Carnival add another charm. Be respectful to the locals. Do not litter the beaches or any part of the place. Do not involve in illegal activities. Drugs and other substances are against the law, so do not get involved in such things. Goa will provide you cherished memories for a lifetime. Savor the beauty and the thrilling time spent in Goa. Experience the pleasures of your holiday in Goa. Author Bio: Rekha Bisht is a travel enthusiast who loves to visit the most popular as well as offbeat places of the world. She loves to share her travel experiences with fellow travelers. For planning memorable holidays in India or any world destination, you follow her write-ups.